Title: All in all, dear friends, this promises to be an interesting summer. 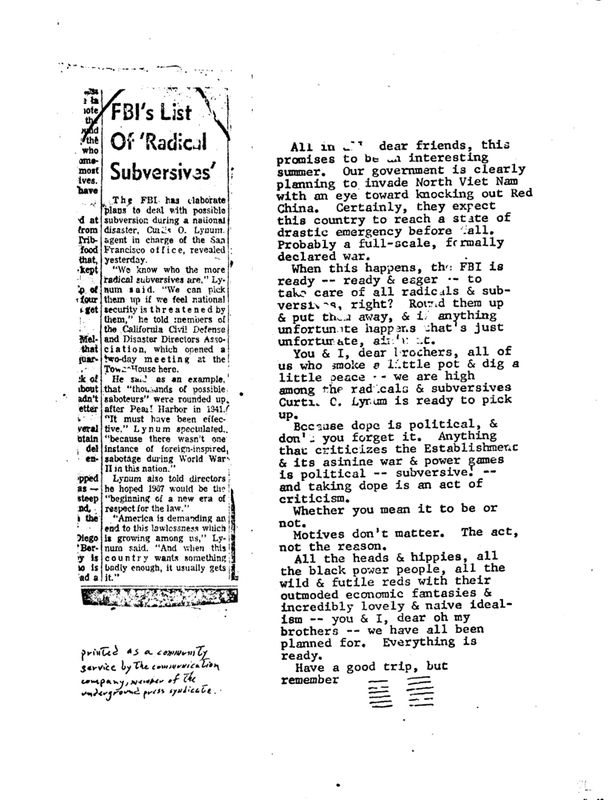 Abstract: Photo reprint of news clip, "FBI's List of 'Radical Subversives'" tells of plans to round up radicals during a national disaster. ComCo editorial elaborates the implications for "all of us who smoke a little pot & dig a little peace". I Ching reading. "Because dope is political, & don't you forget it. Anything that criticizes the Establishment & its asinine war & power games is political -- subversive! -- and taking dope is an act of criticism." The FBI has elaborate plans to deal with possible subversion during a national disaster, Curtis O. Lynum, agent in charge of the San Francisco office, revealed yesterday. 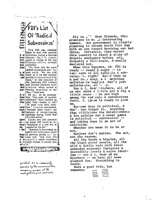 "We know who the more radical subversives are," Lynum said. We can pick them up if we feel national security is threatened by them," he told members of the California Civil Defense and Disaster Directors Association, which opened a two-day meeting at the Towne House here. He said as an example, that "thousands of possible saboteurs" were rounded up after Pearl Harbor in 1941. "It must have been very effective," Lynum speculated, "because there wasn't one instance of foreign-inspired sabotage during World War II in this nation." Lynum also told directors he hoped 1967 would be the "beginning of a new era of respect for the law." "America is demanding an end to this lawlessness which is growing among us," Lynum said. "And when this country wants something badly enough, it usually gets it." All in all, dear friends, this promises to be an interesting summer. Our government is clearly planning to invade North Viet Nam with an eye toward knocking out Red China. Certainly, they expect this country to reach a state of drastic emergency before fall. Probably a full-scale, formally declared war. When this happens, the FBI is ready -- ready & eager -- to take care of all radicals & subversives, right? Round them up & put them away, & if anything unfortunate happens that's just unfortunate, ain't it. You & I, dear brothers, all of us who smoke a little pot & dig a little peace -- we are high among the radicals & subversives Curtis C. Lynum is ready to pick up. Because dope is political, & don't you forget it. Anything that criticizes the Establishment & its asinine war & power games is political -- subversive! -- and taking dope is an act of criticism. Whether you mean it to be or not. Motives don't matter. The act, not the reason. All the heads & hippies, all the black power people, all the wild & futile reds with their outmoded economic fantasies & incredibly lovely & naive idealism -- you & I, dear oh my brothers -- we have all been planned for. Everything is ready.